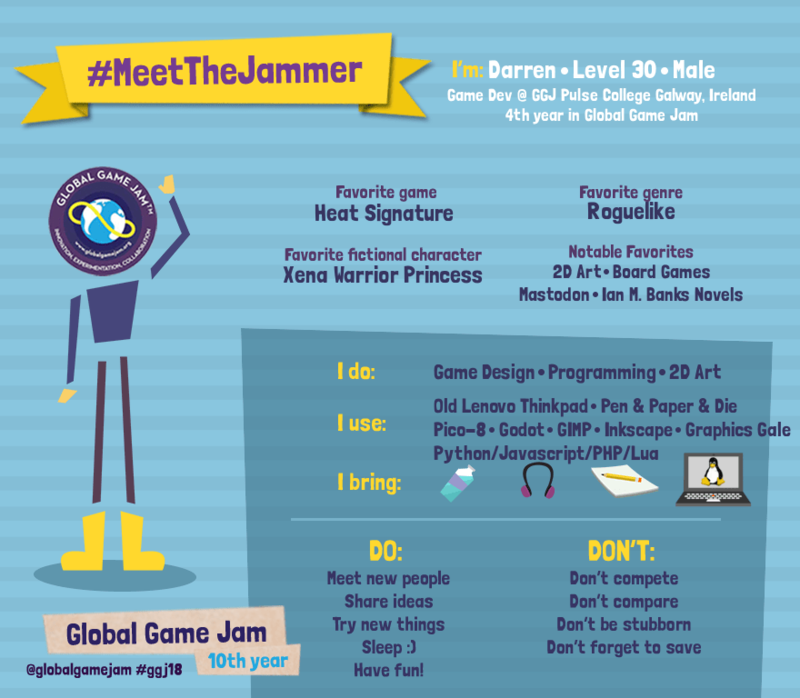 I’m delighted to be able to attend my 4th Global Game Jam in Galway. I’ll be switching to another game engine for the jam AGAIN – this time I’ll be using Godot Engine instead of Pico-8 (which I have been using these past few months). During last year I also experimented with Pico-8, a fantasy console. Pico-8 is a great little thing. It’s a joy to use. It is also super quick and has a friendly, open community who share their games. The game’s source code is generally easy to come by too and helps you to learn from the community. Pico game devs tend to share code on twitter too – they really seem to have a friendly bunch of folks at the core of it. After using pico-8 for a bit and loving it you’d likely expect me to use that for the Global Game Jam. I would in a heart-beat! But not this time – as I have a team to consider! For Global Game Jam 2018 I am going to be jamming with two friends. I need to choose a game engine that will help the team do well. The team’s artist, Cathal Duane, is an incredibly skilled professional illustrator. I feel that the limitations of pico-8, while fun for me, would be a bit too harsh for Duane’s normal approach. Godot Engine will be well able to handle Duane’s more visually complex 2D art creations. Through my code-brain, I hope to make them interactive and fun to play with. Hopefully, some of Duane’s visual humour comes across. Once we have a team meeting we’ll decide which way to go. Until then I’ll be sorting out my dev environment and wondering what changes have happened inside of Godot Engine in this past year. I aim to make a playable prototype by the end of the gamejam with art, sounds and music, and a strong sense of the feeling we want to evoke in the player while playing the game, and have fun making it! The details of this game prototype are vague at best and will be more clearly defined during the jam. To get there will be an intense sprint, but I want to achieve this in as healthy a way as I can. I expect to take regular breaks, go for the odd walk and get a solid 8-hours of sleep each night. This is a gamejam, not a life or death situation. By making use of freely available placeholder assets I expect to save time. I (hopefully!) make more efficient decisions than the past by carefully choosing what NOT to put in the game. I’m aim to have fun! Ultimately I expect that Global Game Jam 2018 will teach me more important lessons about game development, time management, team work and about my own limitations. I hope to be able to share these experiences with the community around the world and make some new friends. I have more experience and understanding than before which gives Present-Darren a much higher likelihood of success than Past-Darren, so I expect to get farther along than previous jams. But I also want to keep expectations low – there will always be unknown challenges to face!